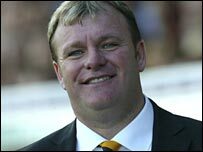 The manager and former chairman of Boston United have been spared jail terms after cheating the taxman to "prop up" their ailing football club. Manager Steve Evans, 43, and Patrick Malkinson, 64, were given suspended sentences for disguising wages and bonuses as expenses between 1997-2002. London's Southwark Crown Court was told the scheme was so successful it transformed the Lincolnshire club. The five-year tax scam resulted in £323,000 in taxes being withheld. Malkinson was given a two-year sentence while Evans received a one-year sentence, both suspended for two years. The Pilgrims saw gates swell by 1,000% during the period of the tax fraud. Evans, of The Cloisters, in Eye, near Peterborough, Cambridgeshire, and Malkinson, of Spilsby Road, Boston, each pleaded guilty to one count of conspiring to cheat the public revenue between 5 April, 1997 and 1 June, 2002. The court heard the fraud gave Boston such an edge over their competitors that they enjoyed "remarkable success", being promoted from the Unibond League to the Nationwide Conference and then the Football League. The team was promoted to the Football League in 2002 from the Conference after pipping Dagenham & Redbridge to the title. The extra revenue generated by the illegal tax savings allowed Boston to attract players who would otherwise have been beyond its reach. Charlery told BBC Radio Lincolnshire that he was paid his fee in bundles of cash in an envelope. "If we could turn the clock back, we would," he said. Melvin Moxon of Boston United Supporters Trust said: "The people of Boston were embarrassed, annoyed and fed up with the events of the past five years - the sentences reflect the seriousness of the offences". Evans left the club after an earlier Football Association inquiry but returned to the Pilgrims in March 2004. He was born in Glasgow and played at Bolton Wanderers, Clyde, St Johnstone and Ayr United. Former Pilgrims' accountant Brian James and book-keeper Ian Lee were cleared of conspiracy charges related to the case. General manager John Blackwell was also cleared of the same charge after the judge directed the jury to acquit him due to a lack of evidence.